Chloe Jones of Oceanside High School in Rockland delivers a pitch during last Saturday's Class B North semifinal victory over Old Town. The junior has pitched three straight shutouts in this year's playoffs. A high school softball pitcher faces lots of pressure in a playoff game but Oceanside High School ace right-hander Chloe Jones thrives on it. 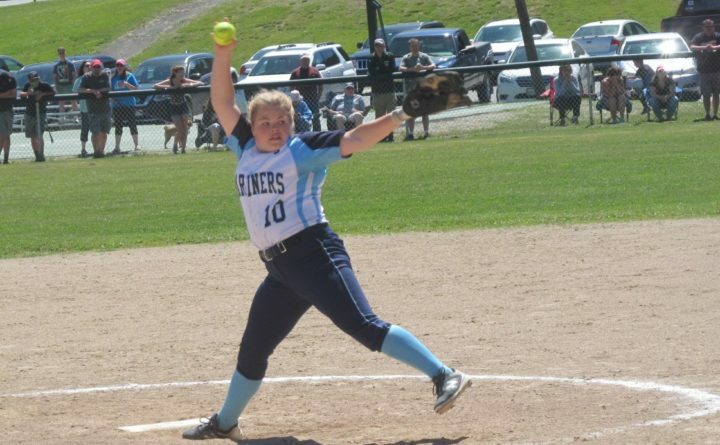 The Mariners of Rockland/Thomaston have scored only seven runs in their three playoff games but Jones has thrown three shutouts to earn the third-seeded and 17-2 Mariners a berth in the Class B North final against 18-0 and top seed Brewer at the Witches’ Coffin Field at 3 p.m. Wednesday. Jones beat Mount Desert Island 1-0 before posting 3-0 wins over Medomak Valley of Thomaston and defending two-time state champ Old Town. Jones tossed a masterpiece against Old Town, allowing just two hits with eight strikeouts and one walk. The Coyotes hit just four balls out of the infield and Jones allowed only a single and a walk over the last six innings. “That’s my favorite time, the adrenaline, the atmosphere, all of your teammates yelling at you to do your best. It’s just fun,” Jones said. She has a variety of pitches and has good zip on her fastball and rise ball but the pitch that defines her is a nasty changeup. Hitters looking for a fastball get a slow delivery instead and that gets them way out on their front foot. The result is usually a weak swing and a miss or a little popup. The backhand or flip changeup requires a pitcher to turn her hand over and flip the softball with the back of her hand facing her catcher. It is also important that the pitcher’s arm speed is the same as her fastball so the hitter can’t recognize the change-up. “It took me a full year to master it and I’ve been practicing it ever since,” said Jones, who has thrown it since seventh grade. “Everybody always told me I needed a changeup, My hands aren’t very big. “I love it. I have super confidence in it,” added Jones. Jones also plays soccer and basketball but softball is her first love and she works on it year-round. She began going to pitching instructor Rick Roberts in Ellsworth a year ago. Worcester said Jones is one of those rare softball players who loves the game, plays year-round and is always striving to get better. “She has improved every year. She has increased her speed and improved her curve and rise ball. She can paint the corners, inside and outside, up and down,” he said. She comes from an athletic family. Her father, Ricky Jones, is an an 11-time Maine State Golf Association Golfer of the Year. “He’s one of my role models. He always pushes me to be my best. He’ll tell me what I did wrong and what I can do to improve it,” said Chloe who added that her mother, Christienne, was an outstanding soccer player. Jones, a junior who has been the Oceanside ace ever since her freshman year, not only shut out Old Town but she drove in what proved to be the winning run with a single. “I knew I didn’t hit well last year so I worked really hard on that in the batting cages in Portland. It has paid off. I’m super proud,” said Jones. She said she is “super excited” about Wednesday’s match-up with Brewer ace Libby Hewes and the Witches, who beat Oceanside 4-2 during the regular season and 3-2 in nine innings in the KVAC championship game. But she isn’t going to let the pressure get to her. “It’s just another game. I’m going to go out, have fun and do my best. Hopefully, we can pull it off,” she said.